The Yakovlev Yak-17 (Russian: Як-17 NATO reporting name "Feather")), was an early Soviet jet fighter. It was developed from the Yak-15, the main difference being tricycle landing gear. The trainer version, known as the Yak-17UTI, was the Soviet Air Arms most numerous and important early jet trainer. By late 1946 it was evident that the Yak-15 was a remarkable success. The retention of the Yak-3's cockpit and systems made pilot transition very simple. The only obvious shortcoming was the tailwheel undercarriage. Following testing of the Yak-15U, Yakolev ordered a major redesign, incorporating a nosewheel, while putting aside commonality with the Yak-3. The installation of the engine under the nose greatly complicated the incorporation of a nose wheel. Following initial testing of the experimental Yak-15U, a way was found to continue the welded-steel truss around the nose, surrounding the front of the engine, without making engine changes more difficult. The new nose gear was a castoring unit with a lower fork carrying an unbraked 400 X 190mm tire. This retracted backwards by the unchanged pneumatic system. Presence of the engine made it impossible to stow the retracted unit internally. Instead, it was faired inside a large blister formed by a small door hinged under the nose, as well as a curved fairing attached to the leg, and a permanently attached rear box with an opening through which the tire projected. In addition, the main gear had to be redesigned to place the wheels behind the aircraft's center of gravity. The main gear were moved behind the front spar, and when retracted they filled most of the space between the spars. This caused a major redesign of the fuel tanks, and despite reshaping them around the wheels, reduced their capacity to just 680 liters (150 gallons). This necessatated the addition of two 200 liter (44 gallon) jettisonable tanks, which hung under the tip of each wing. The addition of the tip tanks required a redesign of the structure of the wing so that the aircraft could still maintain a load bearing of 12g. The vertical stabilizer was enlarged and a periscope was also added above the windscreen on most series aircraft. Armamenent, systems, and equipment were virtually unchanged. The prototype Yak-17 was first flown in mid-1947, and passed NII-VVS testing without difficulity, though it was quickly discovered that the additional weight of the tip tanks reduced flight performance compared to the earlier Yak-15, and MiG-9. Like the Yak-15, production was again ordered at Tbilisi. Yak-17 was first publicly displayed at the Soviet Aviation Day of 1949, at Tushino. Single units were presented to Czechoslovakia (designated S-100), and Poland. In operation the Yak-17 had most of the same faults as its predesessor, including relatively low speed and range, and an unreliable engine (still based upon the German Junkers Jumo 004) with a complicated starting procedure. On the other hand, its handling was very simple, and similar to popular propeller fighters such as the Yak-3 and Yak-9. This made it an excellent transitional machine to jet fighters. As a result, the trainer version Yak-17UTI accounted for the majority of production, and almost all series-built Yak-17s were of this tandem, dual-control trainer version, which filled an important need in all Soviet air arms. Two-seat training version first seen at 1949 Soviet Aviation Day, Tushino. The most produced variant of the Yak-17, the Yak-17UTI (NATO reporting name "Magnet") was a tandem seat, dual-control trainer. The cockpits for the pupil in front and the instructor behind were the same as in the Yak-21, but the canopy was entirely different. The fixed forward windscreen was deeper and less acutely sloped. Each cockpit was also fitted with its own canopy, sliding to the rear. Fuel capacity was greatly reduced, owing to the elimination of the wing tip tanks. The RSI-6 radio was retained, with the wooden mast positioned alongside the fixed rear canopy. The engine bay was rearranged, and the rear fairing for the nose wheel was eliminated. Initially it was planned to include a single UBS machine gun, but this was omitted on series produced aircraft. Production began in 1948. 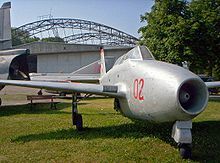 Total production of all Yak-15 and Yak-17 variants was 717 units, with the Yak-17UTI the most numerous of all variants of this early Soviet jet. In the U.S. this aircraft was known as the "Type 26", and given the ASCC reporting name "Magnet". Czechoslovak Air Force tested one Yak-17 aircraft. Polish Air Force operated 3 Yak-17 (transcribed as Jak-17) and 1 Yak-17UTI (known as Jak-17UTI or Jak-17W), from 1950 and were withdrawn by 1955. Instytut Lotnictwa received one Jak-17 from Polish Air Force and used it with civilian markings SP-GLM for tests between 1957 and 1960. Soviet Air Force operated Yak-17 aircraft from 1948 to early 1950s.